This Article provides tips on how you to manage large number of printers in SENTINEL. SENTINEL is an excellent tool for automated label printing and is often tasked with sending print jobs to a large number of printers. We have seen it used in conjunction with ERP systems (SAP, Oracle, etc), integrates with homegrown databases. In some cases, one SENTINEL server handles large number of printers simultaneously. We have seen as many as 90 printers on one server. Most organizations, to reduce printer maintenance and support, will use the same (or as few as possible) make and model of printer throughout the enterprise. With a large number of printers of same make and model, it can be very challenging to keep track of all the printers. SENTINEL can use both TEKLYNX embedded or native drivers for each printer. However, using either type of printer drive can create the same problem of duplicate names. When installing Windows print drivers, the printer manufacturer installer application will often use the same default name for each driver / printer queue created with the exception of a “(Copy 1)” or similar designation to keep the name unique. This notation does keep the names unique but does little to help the user match the driver / printer queue to the correct printer. In Windows, you can rename the printers to represent their locations, department or functions. Assign an alias to each printer. Click here for instructions on how assign alias to a printer. Using this method, the original printer names which include printer make and model are not altered. You can also use the same naming convention across BOTH printers using Windows and TEKLYNX embedded drivers. When you have multiple of the same printer make and model, you can distinguish them by their connection port (USB, LPT, COM, or IP address). You can also change the printer default name, only through CODESOFT, by selecting the printer and press F2. 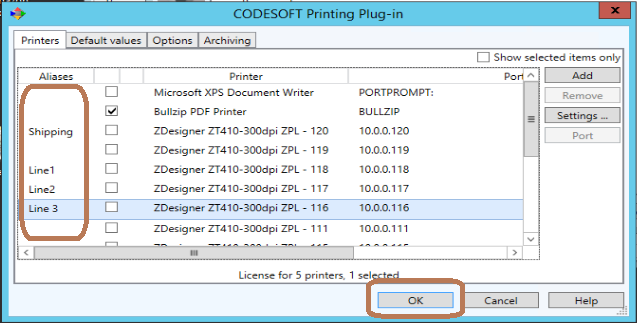 Warning about changing printer names via CODESOFT…Unlike Windows, once the ‘native driver’ printer is renamed, you will loose the identity of the printer driver. In other words, you can no longer tell which TEKLYNX printer driver was assigned to the printer.